We are excited to Welcome Rock’s Kitchen to North Rockland and for hosting our first event there. Please join the North Rockland Chamber, the Academy of Finance and Rock’s Kitchen for a great informative event. INTRO TO OUR NEWEST INTERNS! Please join us at Rock’s Kitchen to Network, hear about and meet the newest candidates for internships for the North Rockland School District. Tim Ahle, the head of the Academy of Finance is looking to secure internships for North Rockland High School AoF students. This is a great way to help the community introduce the next generation of Entrepreneurs to the growing business world in our community. PLEASE PASS THIS ON TO OTHERS THAT MAY WANT TO COME OUT TO LISTEN TO THESE STUDENTS AND PERHAPS HELP THEM FIND PLACEMENT. This is an integral part of education for these select students that have made it into the Academy of Finance. 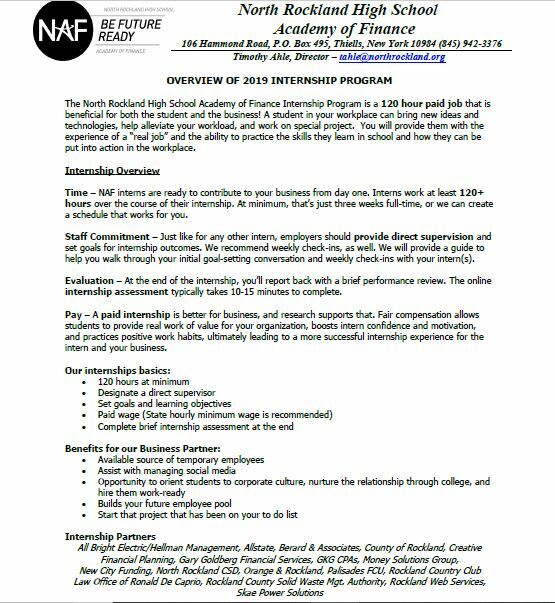 Tim Ahle will be giving a 10 min presentation explaining the North Rockland Academy of Finance Internship Program at 7 pm.